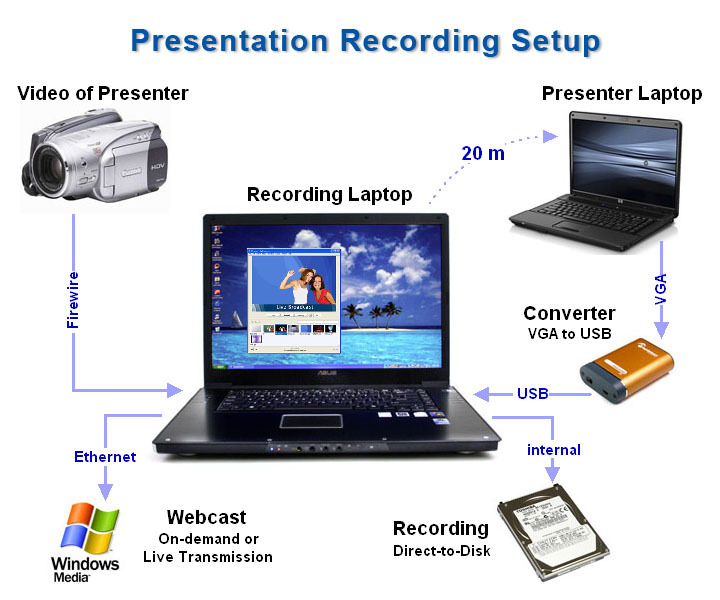 Presentation recording is required to document corporate briefings, trainings, and conference proceedings. It is different from standard video recording in the sense that we're recording the screen graphics in addition to audio and video of the presenter. The physical setup involves two computers, one for the presenter and one for recording. The presenter's machine is usually a laptop connected to a display projector. We split the VGA signal before it goes to the projector and run a 20m long VGA cable to the location of our recorder, typically at the back of the room next to our video camera. There we use a special adapter to convert VGA into USB so that it is captured by the recorder. We also run a short firewire cable between our camera and the recorder. All of these connections are shown in the layout at right (click to enlarge the image). USB Audio mixer accepts mic or line inputs and has metering lights mics. Then we are able to monitor on headphones and set levels for the audio portion of the recording. With multiple presenters and audience applause, it's important to be able to ride the levels. 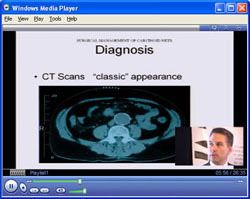 shows picture-in-picture effectcan be captured at 5-10 frames per second, fast enough for animation, handwriting or even video playback (eg- of a medical procedure). The result is a high quality video (typicaly 512 x 288 screen size) which switches between the presenter and the presentation graphics. Picture-in-picture effects as shown in the screen capture at right keep both perspectives in context. The video is recorded direct-to-disc or can be transmitted as a live webcast. Our preferred format is Windows Media, but we can also support Quicktime. To get a feel for the final result, please view the recorded webcast shown in the screenshot at right, or check out our showcase to see other examples of presentation recording.